The town of Taba is is located at the northern most point of the Gulf of Aqaba and is the final town on the 'Red Sea Riviera. The dramatic coast of Taba offers you access to some of the most scenic landscapes in the Sinai Peninsula. 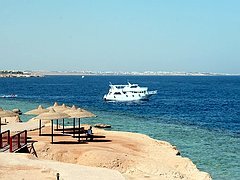 One of Taba�s many charms is it�s striking coastline, above and below the water, offering some of the most unique diving in the Red Sea. Diving and snorkeling in Taba are counted as some of the most interesting activities available to tourists in this small quaint border town on the Sinai Peninsula. The Taba region is a virtually unspoiled red sea diving destination with pristine coral reefs close to the shore, offering ideal conditions for beginners, intermediate divers, and underwater photography. Diving and snorkeling in Taba offers a relaxing experience of solitude with the chance to see a variety of creatures and endemic species such as toad fish (angler fish). Various marine species from seahorse to dolphins abound in the diving areas yuou will be taken by our dive guides. You can expect to encounter tuna, eagle rays, turtles, barracudas, schools of lionfish, schools of batfish, schools of jackfish, and nudibranchs. The specialty of Taba diving is the well preserved state and untarnished condition of the coral reefs with unique marine life. Directly in front of the Diving Center on the hotel beach is a pristine reef, the south end of the dive site Muqabila, centrally located in the midst of all the best diving sites of the area. The house reef is unspoiled with superb corals, an underwater nursery that is a paradise for photography, perfect for Night Diving and suitable for Open Water Courses, Introductory Dives, and any level of divers. Enter the water via a rift between two large patches of reef, and when you first enter the water there is a large coral pinnacle with frogfish hiding among the corals. The sandy bottom is full of critters, such as stonefish buried in the sand, and sea wasps scurrying about their business. A split in the reef takes you through to deeper water sloping down to depths that vary to about 40 metres. There are many occasions when Rays can be observed particularly Eagle Rays. If you are lucky the resident turtle may also make an appearance. The reef wall on your left is home to a myriad of creatures including more frogfish, ghost pipefish, shrimp, and octopus. The fish life here is prolific! The most beautiful reef in the area, located just before Pharoah Island about 250 meters from the shore. 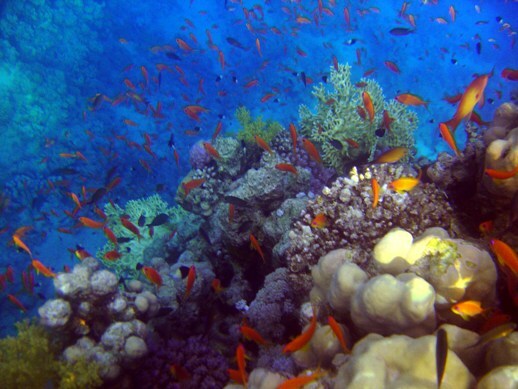 This amazing dive site inhabits virtually all the reef fish of the Red Sea in one place! At the deep side of the reef there is the most beautiful collection of small, Red Sea Banner Fish all swimming together as one. In the center of the reef there are literally thousands and thousands of Glass Fish and Silver Fish. Consequently, all the hunters from the open sea are feeding here. Inside the corals, there are many Lion Fish asleep waiting their turn to feed at night. 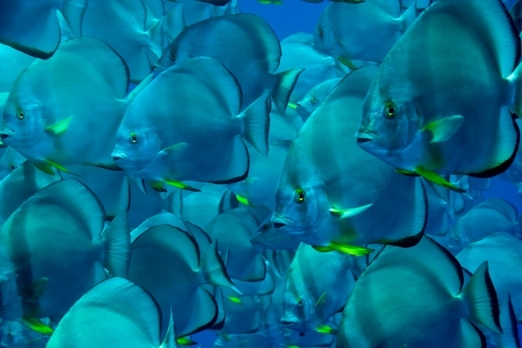 Other fish include many Two-Bar Bream Fish, Batfish and the biggest Giant Sting Ray in this area. Also known as Coral Island, this island lies approximately 250 meters off the Sinai coast in a lagoon that is rich in reef life and surrounded by corals. On the island is a castle built by the Crusaders of the twelfth century. when Salah El Din was the King of Egypt, and has recently been restored by the Ministry of Egyptian Antiquities. From Pharoah Island there are amazing views of Saudi Arabia, Jordan, and Israel. The island has much for non-divers to see, so there is plenty for the whole family. Pharoah Island offers 5 diving sites, 3 by boat and 2 from the Island, one of them a spectacular wall dive. The area is completely sheltered from waves and current, also suitable for snorkelers, with the depth ranging from 3 to 30 meters. You can see an abundance of marine life, such as glass fish, flying fish, sea cucumbers, turtles, eagle rays, grouper fish, frog fish, nudibranch, crocodile fish, table corals and some wonderful sea sponges. The Fjord is excellent for all diving and snorkeling activities, consisting of two diving sites: 'Fjord Banana' and 'Fjord The Hole', one of the more impressive dives sites in all of the Red Sea. 'Fjord The Hole' has a unique construction similar to Dahab�s famous Blue Hole / Bells. The entrance is a chimney shaped hole, forming a perfect circle approximately 20 meters in diameter, starting at 9 meters and going down to 27 meters. After entering the hole, ascend to 8 meters to find a pinnacle with plenty of Glass Fish and Silver Fish, where you can watch predators from the open sea come to hunt. 'Fjord Banana' is a shallow reef in the shape of a banana with much to see. You can see red anemones, glass fish, grouper fish, schools of yellow-tail barracuda, stone fish, frog fish, sting rays, and turtles. 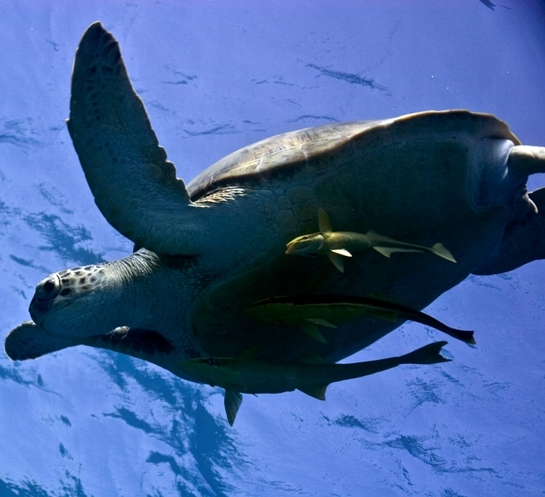 Most of these species inhabit the shallower area of the site, where they may be enjoyed by divers and snorkelers alike. Sun pool is a Salt Water Lake next to the sea, but supports no life. A shallow dive, with a maximum depth of 16 meters, over to the beautiful shallow reef next to the Sun Pool leads to many Fire Corals growing here. 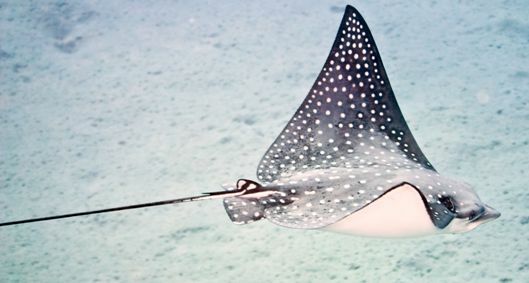 The reef is rich in fish, among them Eagle Rays. Discovered 20 years ago and named after the eldest son of the man who discovered this Red Sea dive site. 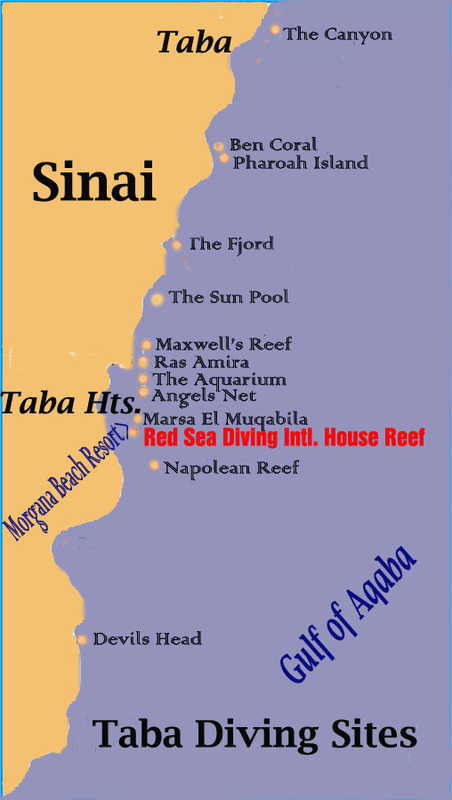 Maxwell�s Reef lies in front of the Ras Amira dive site about 500 meters off the Sinai coast. The dive site looks like an underwater island, a seamount with a minimum depth of 12 meters, dropping away to 60 meters. Sometimes you will find sea current and this is one of the more challenging dive sites in Taba, recommended for advanced divers only. You are certain to see Bat Fish, Red-Tooth Trigger Fish, Turtles, Stone Fish, Sting Rays, along with Spanish Dancers in the daytime, and brilliant huge table corals with millions of anthias swarming around the coral heads. In Arabic, 'Princess Head', an appropriate name for this royal and majestic site. The dive site is completely sheltered from waves and current, with a very gentle slope ranging in depth from 6 to 30 meters, making this site a nice quiet spot for diving and snorkeling. 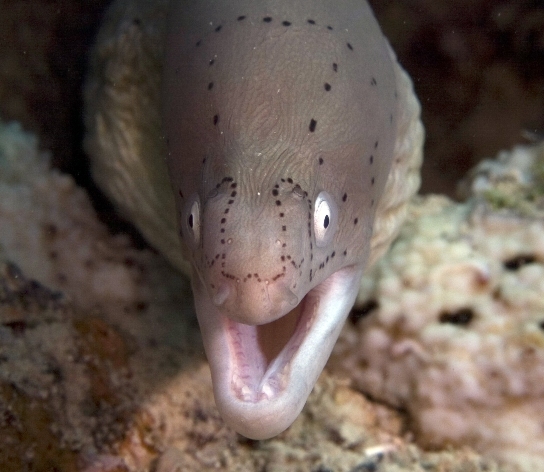 At Ras Amira you can see grey moray eels, octopi, turtles, crocodile fish, weaver corals, and some excellent table corals. Aptly named, this dive site is like a real open aquarium filled with fish and a huge variety of marine life. A great diving site done as a drift dive, that is suitable for all levels of divers and also good for snorkeling. On this site there are glass fish, upside-down shrimp, frogfish, nudibranch, huge table corals in immaculent conditon, puffer fish, groupers, moray eels, turtles, and sting rays. This site is about 200 meters off the coast and consists of two main coral reefs with a grassy strip in between that is 10 meters wide. This is a spectacular site named from the remains of a tangled fishing net which is now home to a great variety of marine life. A large 14 meter high pinnacle attracts pink alcyonarians and scalefin anthias in plentious numbers. Beautiful table corals and huge coral blocks exist at this site making it full of life. Three amazing sites are found at Marsa El Muqabilla, suitable for all diving and snorkeling activities. The Canyon is a deep dive at a maximum depth of 40 meters, only permitted for Deep Diver Specialty Divers. For the Advanced Open Water Divers this is a beautiful 30 meter dive on a multilevel basis. The deep part of the dive has amazing hard coral formations, reminiscent of the moon's surface, and the shallow part of the dive is full of life with much color and fish life. Muqabilla Major is situated to the left of the Canyon with a maximum depth of 18 meters, suitable for all levels of diver certification from Open Water and above. The geography of the site is breathtaking with schools of Barracuda and Batfish always seen. 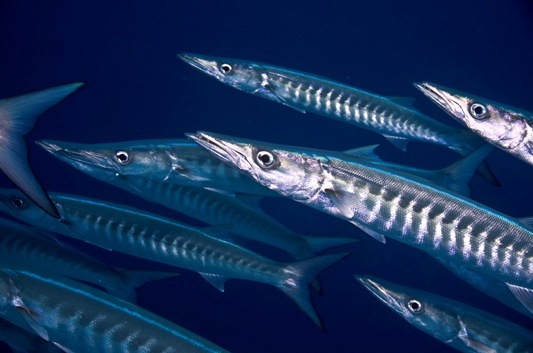 A resident school of yellow-tailed barracuda are regularly seen patrolling the reef ledge, along with blue spotted rays, eagle rays, stone fish, giant puffers, and turtles are regular visitors. Finger corals are abundant which make beautiful shapes that look like walls of a castle. Muqabilla Minor offers a shallow dive at a depth of 16 meters. 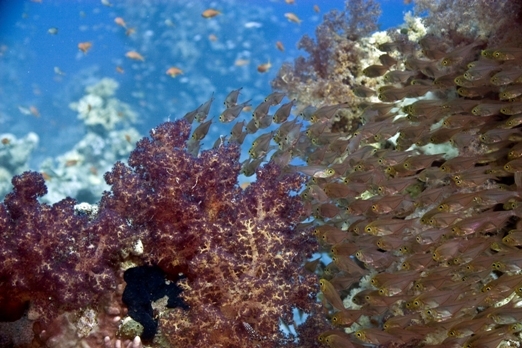 The reef is home to fire corals and many different varieties of reef fish. This site makes an ideal first dive for new arrivals to Taba, with a good range of fish, calm waters and few currents. Ras El Shetan, The Devils Head in Arabic is situated at an active Bedouin Camp, and most divers will need to use two tanks to complete this particular diving site, which is well worth the extra weight as this dive presents some truly spectacular scenery. The beginning descent contains a patch of sea grass bordering a coral garden that has been called a �Japanese Garden� for its striking beauty and remarkable coloration. 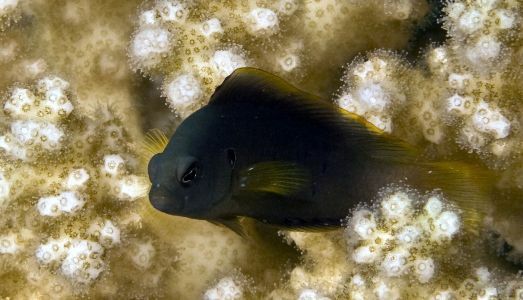 The site is also home to numerous Lemon Goby and Blue Green Puller Fish that makes it tremendously popular for underwater photographers.